Few life experiences can beat that of getting up close and personal with Africa’s Big 5 and big cats. Asilia’s outstanding camps are located in some of the best pioneering areas in Kenya and Tanzania. On safari here, coveted sightings of big cats and the big five of Africa are common – in fact, you get so close to these glorious animals you can feel their extraordinary power. Covering some 25 000km², the Serengeti-Mara ecosystem encompasses a wide range of habitats, which is why it is home to Africa’s highest variety and concentration of wildlife, and of course, The Big 5. Ruaha hosts an incredible 10% of the world’s lion, while Tarangire is famous for its vast elephant herds. These are the safari destinations of choice for discerning travellers looking for intense big cat and Big Five encounters. Predator/prey interactions are frequent: witnessing a kill is both primal and stirring. Moments such as are a reminder of why it is so important to keep these pristine wilderness areas intact for future generations. A Big Five Safari – Unmissable! ‘The Big Five’ was a term originally used by hunters to identify the five most dangerous species to hunt on foot: rhinoceros, elephant, buffalo, lion and leopard. Even if you are only hunting these animals through the lens of your camera, the Big Five still have the power to evoke awe and a sense of respect verging on fear. Each time you get up close to one of these iconic creatures you experience a real thrill of adventure (and a sense of your own microscopic importance to the planet). The term ‘Big Five’ has become a definitive marker of the calibre of wild areas. Only a large expanse with a healthy ecosystem can sustain a healthy population of game such as elephant, buffalo and lion. All of our camps are specifically chosen to ensure incredible wildlife sightings, but if you have a special area of interest you may want to include one of our specifc camps below. Ol Pejeta Bush Camp in Kenya is the only place on earth where you are still able to see a northern white rhino. Due to poaching only two live today, and they are all in the Ol Pejeta Conservancy. They are given sanctuary in a 700-acre enclosure protected by 24-hour armed security – a sad necessity in today’s harsh world. And if you hope to glimpse a rhino in the wild, Ol Pejeta is the place to go. It has over 100 critically endangered black rhino and 20 southern white rhino. Of course, all Asilia’s camps – strategically situated in remote and pristine locations along the migration route – are hot spots for world-class big cat viewing. In fact, we have some famous cats that have starred in National Geographic documentaries through the years. Our ‘Best of the Big Cats’ itinerary focuses on Namiri Plains and Rekero Camp. Remote, beautiful and game-rich Ruaha National Park is another gem that discerning travellers head to for particularly rewarding big-cat sightings, as is Oliver’s Camp in Tarangire National Park. East Africa’s very best cheetah-viewing opportunites are at Namiri Plains. This pioneering camp is in the remote eastern Serengeti, an area that is now teeming with cheetah and lion after being closed for 20 years to allow populations to recover. The Maasai Mara contains the highest density of lion in Kenya. Other predators in the area include leopard, cheetah, spotted hyena, black-backed and side-striped jackal and the rarest of them all, the elusive African wild dog. Given the cats’ curious nature and the iconic African backdrop of blue sky and waving grass, you will find that photographing them is fun and rewarding. It is also possible to learn about protection initiatives for the Mara’s big cats from a Kenya Wildlife Trust researcher. Eighty animal species and 10% of the world’s lion population can be found in Ruaha. The density of lions in the park is not only extremely high but prides are unusually large – it is not uncommon to see numbers of 20 or more. Other apex predators living here include leopard and cheetah, as well as almost 100 of the elusive African wild dog, black-backed jackal and hyena. 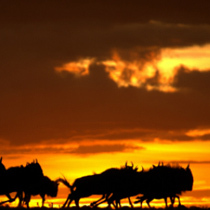 Tarangire boasts a remarkable concentration of big cats and large herds of elephant and buffalo. Adrenaline junkies choose Oliver’s and Little Oliver’s for the high-adventure experiences of guided walking safaris and fly camping deep in this game-rich wilderness. The IUCN Red List puts the status of lion and cheetah as vulnerable, and leopard as near threatened. Asilia Africa is involved in projects that support the big cats in the areas we work in. We take part in tracking programmes that follow the prides as they move and grow over the years. These programmes also keep an eye on the dynamics of the prides. 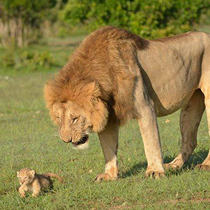 It is important to understand which is the current dominant male lion, how many cubs are born and what happens to them, and even just their day-to-day lives: where the prides move, what it eats, who it fights with, and so on. It can be tiring to get up early enough to be out as the sun rises, but it is well worth the effort. Early mornings usually bring the best sightings and wildlife encounters. Make a habit of taking a siesta in the heat of the day so you have plenty of energy for game drives. If you are in a group or have your kids with you, invest in a decent pair of binoculars for each person. The last thing you want when you’ve happened upon a special sighting is for someone else to be hogging the binoculars. Don’t make the mistake of seeing the entire safari through the lens of a camera. Take the time to look around carefully and quietly and soak up the whole picture. Our guides are a font of knowledge – they really enjoy sharing their bush know-how with guests, and never get tired of answering questions. That said, it is good bush etiquette to keep the volume down: talking loudly may not only scare the animals away but it can be disruptive for the people with you. There is something magical about the sound of the breeze through the grass, the clicks and whirs of the beetles, and the bird calls. You’ll develop an ear for animal sounds, too. The scents of the bush are as telling as the sights. Don’t try to rush from one sighting to the next – enjoy the moment; something unexpected always happens in the bush. This young cub has a rich heritage as the son of Caesar, one of the five sons of the legendary Maasai Mara lion, King Notch.